Christmas is just around the corner and you're probably still stomped with what gift to give the family. Well, I I urge you to get something which the whole family could bond over with. How about a pool table? 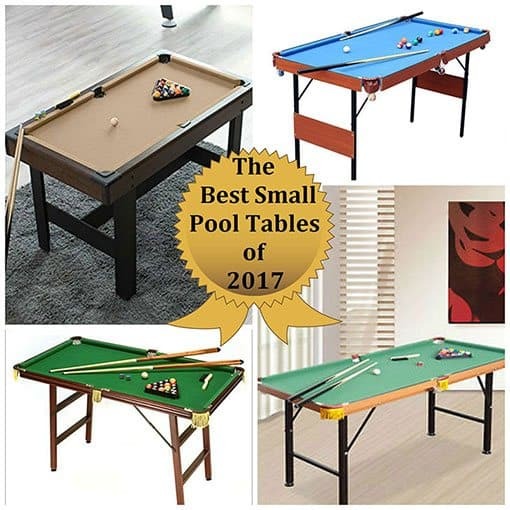 If you are stricken by budget and room space this review is just for you, as we have listed the best small pool tables fit for this year, the new year and years to come. 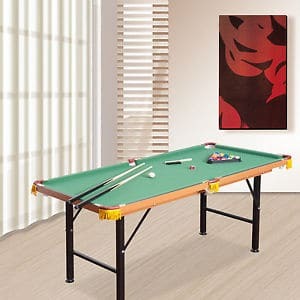 Bello Games Deluxe Folding Pool Table Extra Large 44"
1 Why get a small pool table? 1.5 Oh, might I add, affordability! 5 Bello Games Deluxe Folding Pool Table Extra Large 44"
Why get a small pool table? I’m certain you’re reading through this as you are considering to get a small pool table. This may be to compare the advantages of a small pool table from a regular sized one. Either way, may this guide help you get the answers you need to go for a small pool table over the normal sized pool table. Unlike the regular pool tables, small pool tables are very easy to set up. You wouldn’t need to put a sweat into assembling it after delivery. Even off the store. A lot of these small pool tables comes with an easy to follow set-up manual, and some doesn’t even need that at all. You just need to unfold it and it’s ready to go. No installation means getting into the game as soon as the table arrives in your home. Because of its size and make, small pool tables are normally portable. They are built with their legs foldable making it very easy to move anywhere you like. Portability is always a good thing to have especially when it’s for recreation purposes. Having a small pool table makes owning a pool table even more manageable. Not that owning the normal size pool table is tedious work. But in reality, a small pool table will help make things easier for you in every case. May it be wanting to move your pool table, cleaning it, setting it up, and the list goes on. A portable pool table is manageable and totally handy (in a way). Pool tables are notorious for being big, bulky entertainment pieces. However, the normal sized pool table doesn’t always go well in a tight space. Sure you could force your home to have one of the regular sized pool tables, but it would definitely take up your living space if you live in a regular sized apartment. 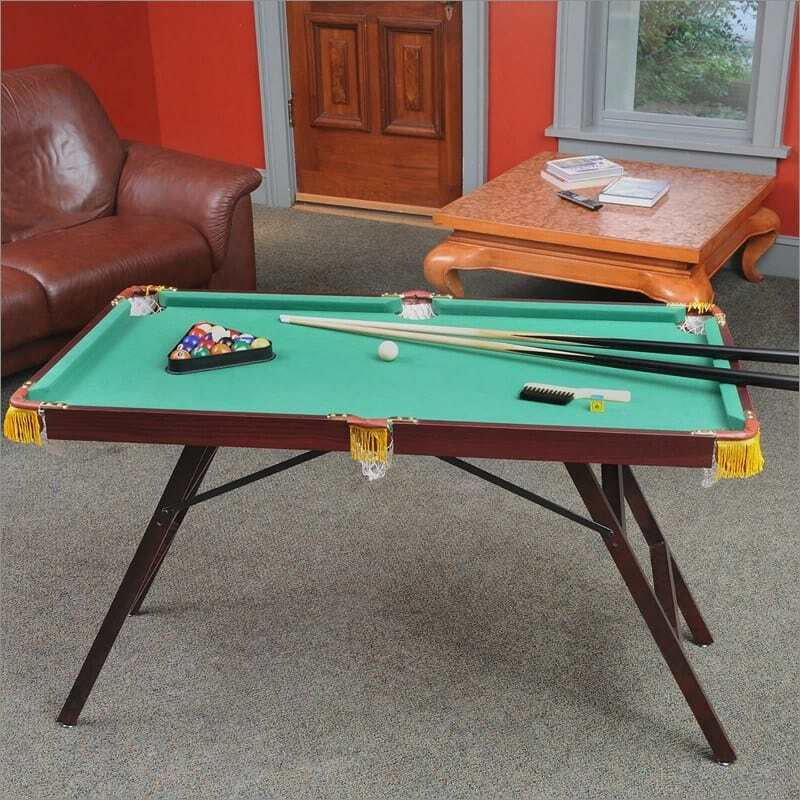 A mini pool table is the best solution to have both a pool table and space in your home. On another upside, a small pool table would definitely be loved both by adults and kids as they could almost play with it (still with a little help from the adults though). Since regular pool tables are far too high and big for kids to play with, small pool tables make the perfect table for the young ones. A small pool table is built with right height and just the exact size which children could play with. Prepare to train all your kids and your kids’ friends to play pool. I’m sure you would enjoy it as much as they do. Oh, might I add, affordability! Well, it may not come as an utter surprise to you that regular pool tables are expensive. The good ones even go for $2000-$8000. That is a whole lot of money to spend if you ask me. One great point to consider when buying a pool table is the price. And it might be satisfying for you to know that a small pool table could cost as low as 1/8th of the regular sized one. The most expensive we’ve seen so far that a mini pool table cost is about five hundred bucks. Now isn’t that just something worth pondering about? This foldable pool table is one to admire. If you want all the benefits of a miniature pool table in one, then this is something you should consider to buy. For its price, you’re definitely getting the best out of every penny and more. The CHH Folding Pool Table is an all packed measuring 44W x 24D x 29H inches. It’s not just its size that you can call perfect, it’s an all-in-one package. It comes with real billiard balls, 2 pool cues, a rack, brush and chalk. This table has foldable legs that makes it very easy to set up and keep at the same time. No need to worry about storage anymore as this could even fit under your bed when folded. The CHH company is known for manufacturing and distributing casino tables, accessories etc. This goes from Mahjong to roulettes. And if that is not enough, they have action figures as well. Quite recently into their venture, they started producing gaming tables. Thus, eventually producing this wonderful piece of foldable mini pool table. CHH’s mini fold up pool table is about half the size of a standard 7-foot table. This means that despite it being small, you will still get to enjoy a pretty realistic game. 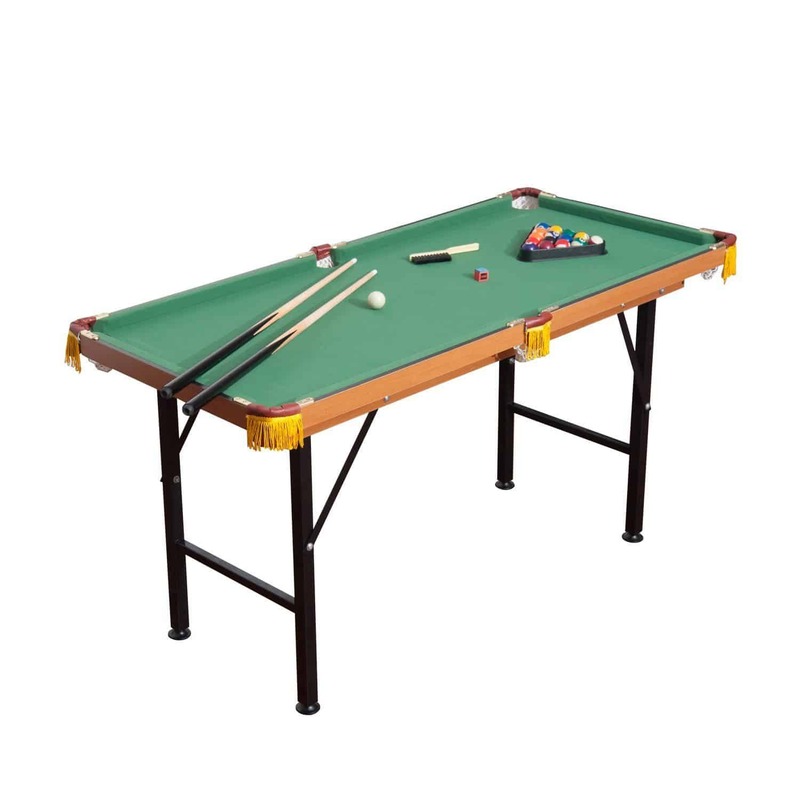 The height of this model is 29 inches which is actually quite close to the standard for professional tables set by the World Pool-Billiard Association (WPA). The WPA states that the height should be between 29 1/4 inches and 31 inches. Basically, this table can be comfortably used by adults with average height as well as by children. Now this mini ﻿﻿poo﻿l table is a sight to see. What makes this table special among others is that it’s made of a solid wood frame. Although what’s surprising is that, all those wood and craftsmanship is housed in a tiny package. Don’t let its size fool you though. There is something about the Blue Storm 4’ Mini Pool Table that may make you want to consider it as your small pool table of choice. Measuring 48L x 26.5W x 31H inches, the Voit is slightly bigger than other mini and portable pool tables. What’s true to life about this piece is that, it actually weighs close to the real thing. Yes, it does. So don’t let its size fool you at all. You may need a little help in moving it around as it weighs approximately 50 pounds according to some users. But I bet you wouldn’t completely mind that considering you save space with this table. Although truth be told, there have been some complaints with some shipping issues (I would assume). But there have been reports wherein the frame has come out after shipping. But let that not discourage you, there’s a limited warranty (either by shipper or manufacturer) to cover this. You just have to make sure to attend to your table as soon as it is shipped to you. Do not wait long before you open up the package and see how things are. Warranty may be voided if you wait a few weeks or for a special day to inspect the item. Bello Games New York’s Deluxe Folding Pool Table may come with a name of “extra-large”. However, it is in reality just a way to refer to its size among other small pool tables. What I mean about that is it’s the largest from the array of pool tables produced by Bello Games. The Bello Games Deluxe Folding Table is made of materials that are built to last. Its hardwood frame and folding steel legs makes it sturdy and elegant at the same time. Its playing surface is one that is comparable to professional pool tables. The only thing is, you get all that beauty and perks in a smaller package. What you’d absolutely love about this table is that, it is a perfect table that requires minimal room space. Seen in this photo is a Hathaway Fairmont 6ft Table with its foldable metal legs. Carrying the Hathaway name, this pool table is guaranteed to give you maximum performance. The Farimont model is specifically designed for homes without ample space for a regular sized pool table. While the standard pool tables of 7’ – 9’ made by the same brand is outstanding, you would think that this being a smaller table performs less. In reality, the Hathaway Fairmont 6’ mini pool table does not short change when it comes to performance. Its state of the art design and complete portability is just among its many selling points. 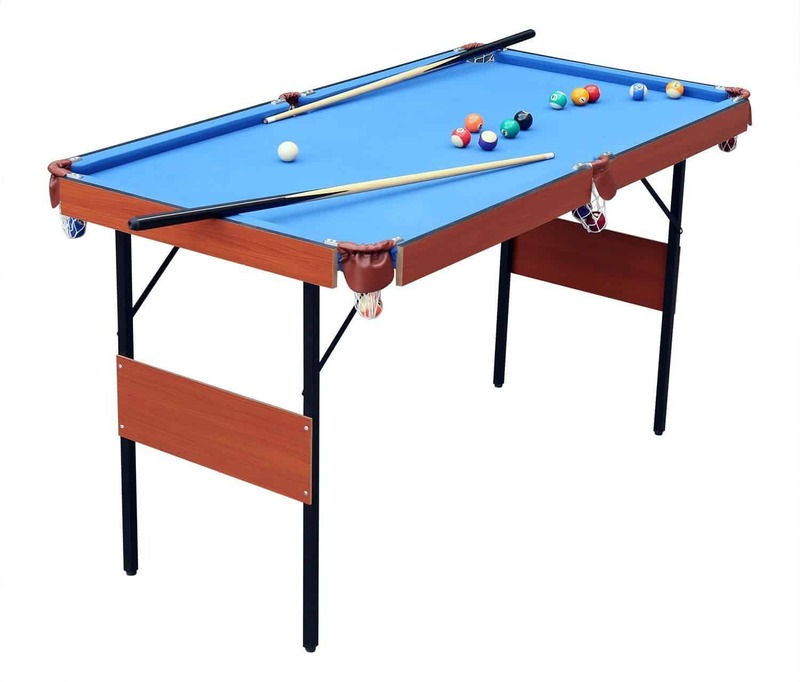 The best part is, it is a very good choice for a family table as even kids and teenagers can play a game of pool or snooker using this table. Become a better pool player as you practice your game in the Hathaway Fairmont portable pool table. It is a very comfortable table to play excellent games as the surface of the table is sufficiently large, which allows the balls to move easily. The table is portable so it can be easily transported to any desired destination. Since it's compact, you can store it anywhere even under your bed or in a closet. And being made of durable material, you can expect solid performance for years to come. The Hathaway Fairmont 6’ portable pool table is designed for suitable pool players who do not have sufficient room for standard-sized game equipment in their home. Being a compact pool table, you can easily place it on any place as long as the height matches the standard requirements. 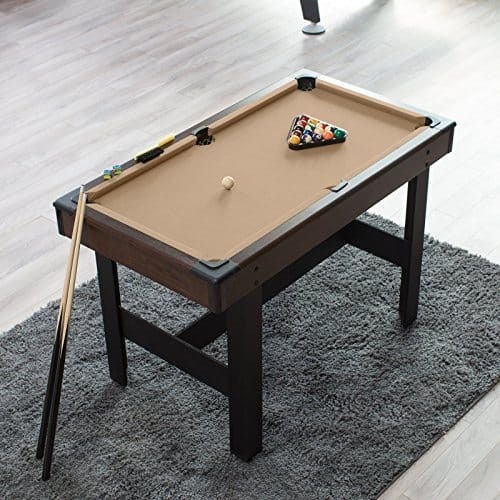 This pool table is a popular choice for families with children for its size and accessories match the height and strength of youngsters perfectly. Have you been wanting a pool table of your own but don’t have enough space to accommodate a regular sized table? Well, let me introduce you to the HLC 55” Folding Space Saver Pool Table. This billiard table is one that you most definitely need to check out. This table does the job, and will sur1ely be a hit among family and friends. Have you been meaning to buy a small pool table for so long but tight on budget? Well the HomCom Folding Miniature Pool Table is the answer to your problem. The HomCom table is a wonderful table comparable to the playing surface of standard tables. The main difference is that; you could get it for less than 5% the price of regular sized tables. 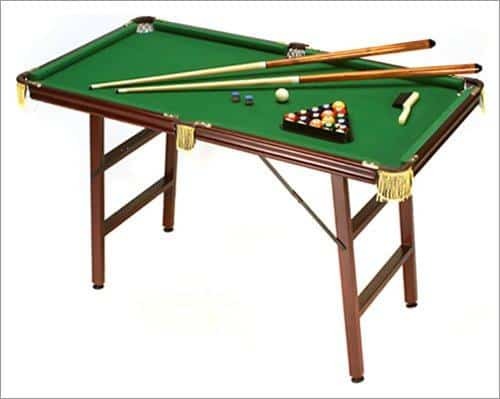 A table that is like the real thing, that’s what the HomCom Folding Miniature Billiards Pool Table is. It is perfectly designed to be an entertainment companion for small homes. Everyone fantasizes about owning a pool table. However, the size of a regular pool table isn’t really friendly to small homes. So the answer is to get a small pool table that’s a miniature version of the normal pool table. One definite selling point of this table is that, it doesn’t short change playing surface wise. The polyester fleece top is something you don’t normally see in small pool tables. Bumper cushion is one other thing you won’t except to find in a pool table of this price. 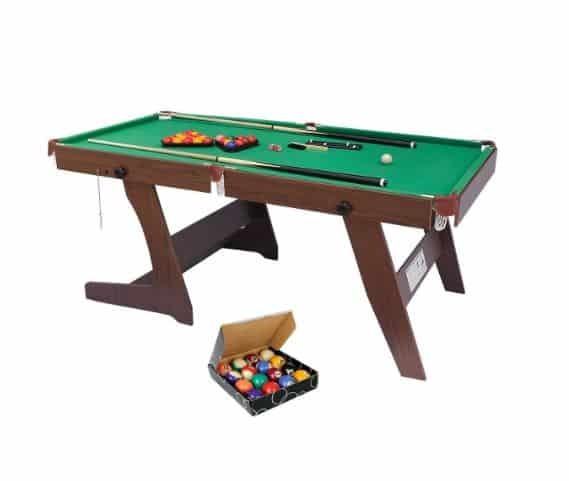 So to sum it all up, the HomCom Folding Miniature Pool Table is a piece that will give you the best value for your money. Also, the best playing experience. A two-﻿﻿way ﻿﻿pool table﻿﻿﻿﻿﻿ that you can use for playing snooker too. 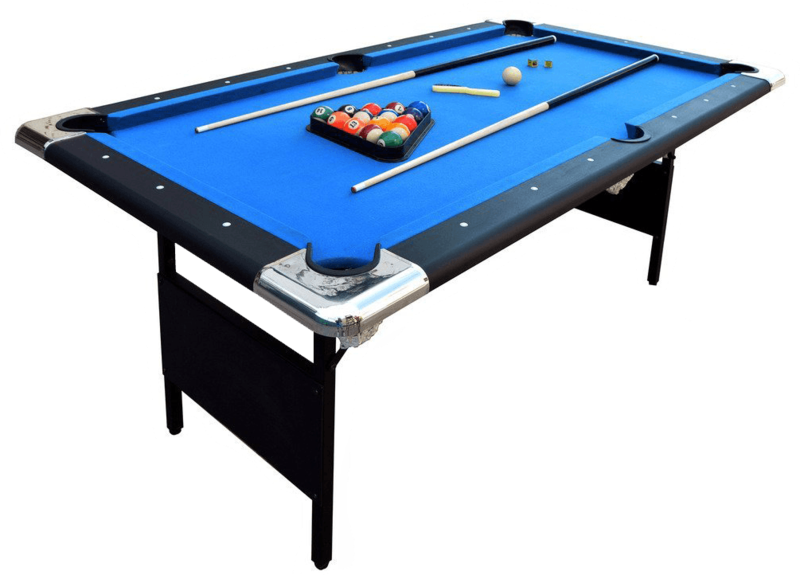 The HLC 6ft Green Foldaway Pool Table give you the best value for your money as it gives you a pool table and snooker table in one. This comes complete with both pool accessories and snooker accessories. What more could you ask for? A price like this is unbelievable enough, let alone for a 2-in-1 table, right? Do you want to spice up the use of your pool table than just using it to play pool? Don’t you wish at times you can play another game, snooker perhaps? Well any pool table can be used to play snooker, the only problem you may likely have is that, you don’t have snooker balls. So instead of purchasing a set of snooker balls (which by the way doesn’t come cheap) you settle with playing just pool. That dilemma of whether you’d buy snooker accessories has come to an end thanks to this fully equipped HLC 6ft Green Foldaway Pool Table.